By 2050, it is expected that about 6.25 billion people, 15 per cent of whom are persons with disabilities, will be living in urban centres. Urbanization has the potential to be an engineer for achieving sustainable and inclusive development for all. 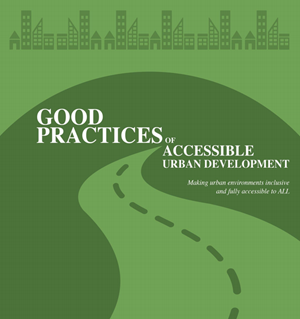 This new publication on “Good Practices of Accessible Urban Development” illustrates and encourages more initiatives and concrete actions from both developing and developed countries in advancing urban development to be accessible and inclusive to all, including persons with disabilities and other special needs. Highlighting key experiences and lessons learned from 24 case studies, the publication contributes to the ongoing discourse around accessible urban development in light of Habitat III and the “New Urban Agenda”. It also provides specific recommendations to advance inclusive urban development for all.